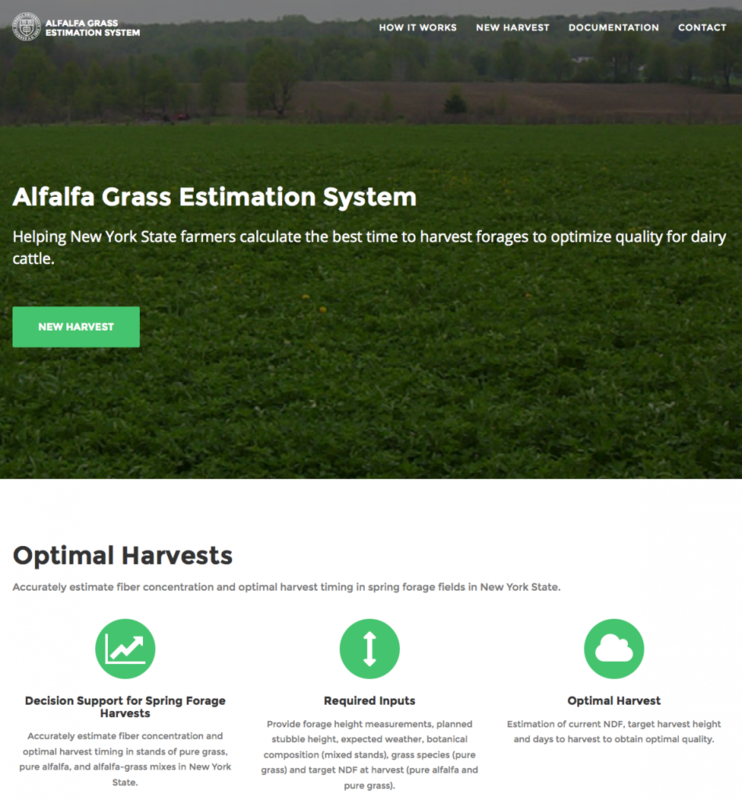 A new AGES (alfalfa-grass evaluation system) app is now available. It is a web-based app that works on the computer and should work on any smart phone. It does not work with MS Explorer (being phased out), but does work with Safari, Chrome, and Firefox. The app is currently at: http://52.90.125.233:8080/. It will eventually be transferred to forages.org. Pure grass or pure alfalfa estimates are available, based on the old system on our website, no picture required. For alfalfa-grass stands, a smart phone picture is automatically inserted into the program. A regular digital camera picture could be used with the program on a computer. •Grass%: Based on processing a photo through artificial intelligence software. •Sample NDF: NDF concentration for parameters entered for the current sample. •Average Field NDF: The average NDF concentration for all samples added to the current field average. •Range in samples/field: The range in NDF concentration for the current field from minimum to maximum. •Estimated days to harvest: Based on average field NDF, target NDF at harvest, and estimated weather conditions, this indicates the number of days to harvest to achieve target NDF. •Target AMAX or GCPY at harvest: Target max height of alfalfa or grass canopy height to achieve target harvest NDF. It also tells you the number of samples taken per field, that are included in the current average NDF. Format takes a little getting used to. Range in height allowed is 16-30″ for pure alfalfa, 12-30″ for pure grass, and 12-40″ for alfalfa-grass, although the upper/lower limits could be pushing it. For alfalfa-grass, Grass% evaluation is based on the entire photograph. Make sure the camera is level, about 3 feet above the canopy, and entire area in the picture is of the stand. I have tried it out on hundreds of photos I have on my computer, that were not used for app development. Seems to work well for spring harvest, good stands. 1. Regrowth harvests (we will need to sample and generate another equation for this). 2. Weedy fields, or poor stands in general. NOTE: Changing the AMAX for a given picture will change the estimated grass percentage for that picture, because “visible” grass vs. actual percent grass changes some with maturity. NOTE: Changing the height that the picture is taken at will affect estimated grass percentage, be consistent and close to 3’ from canopy. Since this is fresh from the programmers, some issues may arise. Later versions will allow results to be dumped off-site. We will do some sample collecting this spring for validation. We still don’t know how many pics per field are optimal. This will depend on field uniformity. Probably 6 minimum to 12 or so. You can observe the range in pics to help sort this out.